Hwaseong fortress was built during the Joseon Dynasty (1392 - 1910). 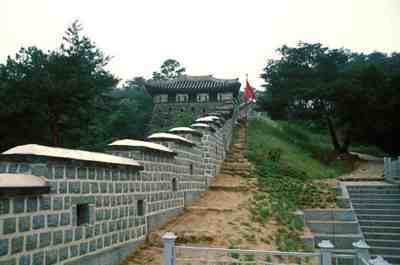 King Chungjo wanted to build a new capital at the base of Paldal-san, near Hwa-san (where his father's tomb is located). The plan for building fortress was designed by Dasan Chong Yag-young. It is called Yukyoung (willow leaf city) because the fortress shape resembled a spring willow leaf. Construction of the fortress took 700,000 workers almost 2 years to construct during 1794-1796.